Ventriculo-peritoneal (VP) shunt remains the treatment of choice for most forms of hydrocephalus. The common abdominal complications include spontaneous extrusion of the peritoneal catheter, obstruction due to fibrous encasement, shunt migration, infection, and cerebrospinal fluid (CSF) fistulas. In the present communication, we describe a case with spontaneous knot formation at the peritoneal end of a VP shunt with no shunt block and detected incidentally. A 10-year-old boy, known case of Crouzon's syndrome, was shunted for congenital hydrocephalus 7 years back using Indian-made medium pressure Chhabra ventriculoperitoneal shunt. Presently, the patient presented to us with a boil on his lower part of anterior chest wall [Figure 1]. Owing to its proximity to the shunt tract, the child was investigated for possible cellulitis of the shunt tract and shunt infection. There was no clinical evidence of shunt malfunction. 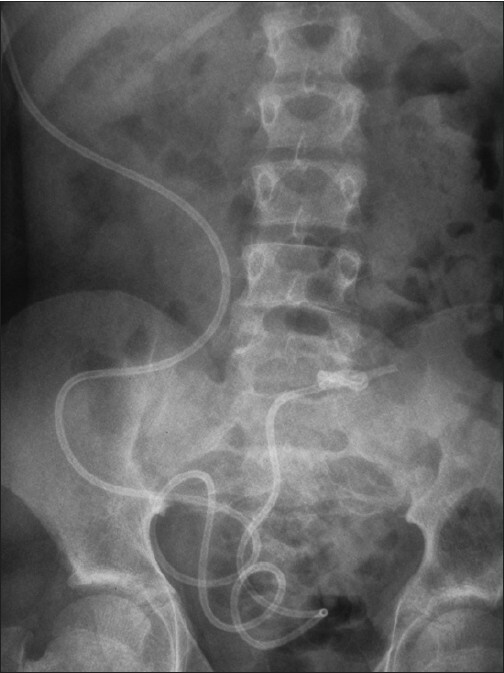 Plain abdominal radiograph revealed a long peritoneal catheter, with a reef-knot, just proximal to its terminal end [Figure 2] and [Figure 3]. 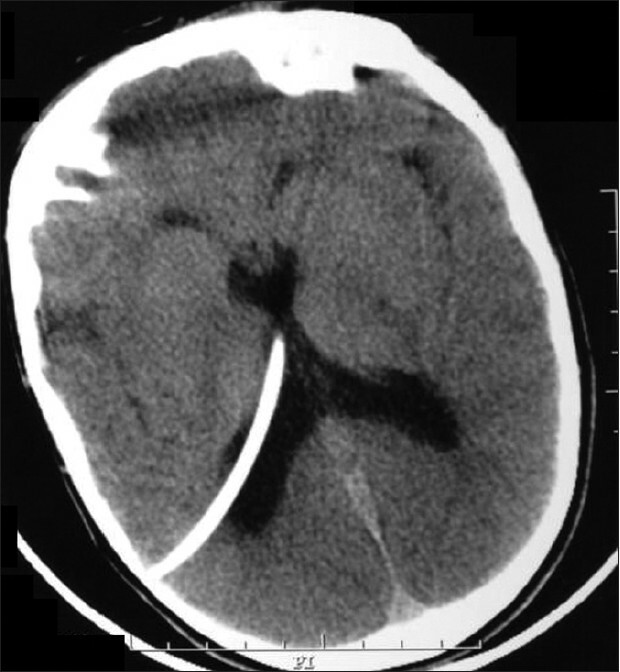 Plain computed tomography (CT) scan of head showed decompressed ventricular system, with normally placed ventricular shunt catheter [Figure 4]. As the boil on chest wall responded well to antiotics (oral cloxacillin 1500 mg/day in three divided doses), no intervention was thought necessary to correct the knot problem. The child is placed under regular follow-up. Peritoneal catheter dysfunction is usually due to placement or migration of the catheter into the extra-peritoneal compartment, abdominal infection, adhesions around distal tip, and rarely migration of the catheter tip into abdominal or thoracic viscera. Spontaneous knot formation in the peritoneal catheter is a rare occurrence and a few cases [Table 1] have been reported. ,,, Except one reported case,  all had presented with malfunctioning shunt. Catheter characteristics-Length, diameter, elasticity of catheter material. The probability of forming a composite knot rises significantly with the confinement. Other geometrical indicators such as writhe and chirality are also described. In knot theory,  writhe is the total number of positive crossings minus the total number of negative crossings. Reidemeister move refers to one of three local moves on a link diagram. Each move operates on a small region of the diagram and is one of three types. The type I move is the only move that affects the writhe of the link, while the type III move is the only one which does not change the crossing number of the diagram. In the mathematical field of knot theory,  a chiral knot is a knot that is not equivalent to its mirror image. An oriented knot that is equivalent to its mirror image is an amphichiral knot. All knots described in the reported cases seem to be of chiral type. The terminal end of peritoneal catheter involvement for knot formation is common to all reported cases. 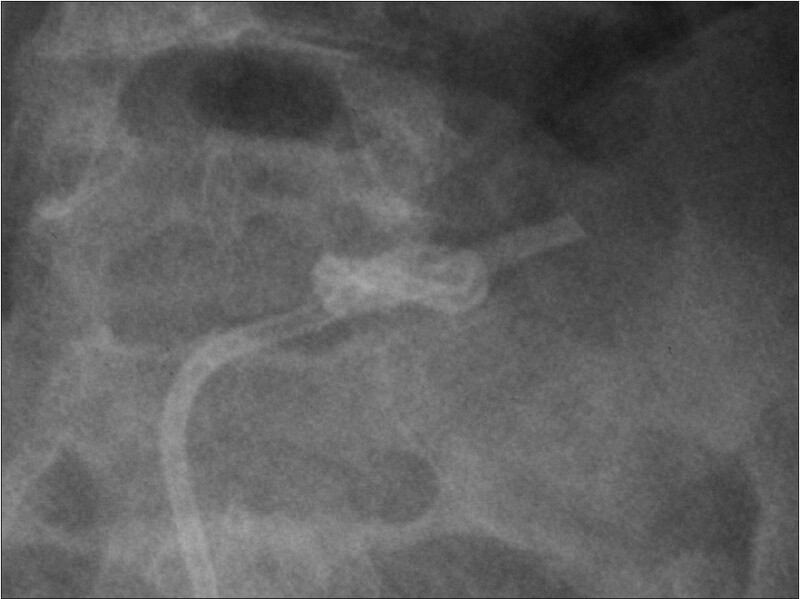 Spontaneous knotting of peritoneal catheter remains a rare cause of shunt malfunction. Preoperatively, such a complication may be diagnosed after obtaining plain abdominal radiograph. The normally functioning shunt may also develop knotting of peritoneal catheter, but the intervention is not warranted, till the patient is asymptomatic. Such patients should be regularly followed up. 1. Mohindra S, Singla N, Gupta R, Gupta SK. CSF fistula through the umbilicus following a shunt surgery: A case report and literature review. Pediatr Neurosurg 2007;43:396-8. 2. Chopra I, Gnanalingham K, Pal D, Peterson D. A knot in the catheter- -an unusual cause of ventriculo-peritoneal shunt blockage. Acta Neurochir (Wien) 2004;146:1055-7. 3. Raymer DM, Smith DE. Spontaneous knotting of an agitated string. Proc Natl Acad Sci U S A 2007;104:16432-7. 4. Eftekhar B, Hunn A. Ventriculoperitoneal shunt blockage due to spontaneous knot formation in the peritoneal catheter. Case report. J Neurosurg Pediatr 2008;1:142-3. 5. Starreveld Y, Poenaru D, Ellis P. Ventriculoperitoneal shunt knot: A rare cause of bowel obstruction and ischemia. Can J Surg 1998;41:239-40. 6. Woerdeman PA, Hanlo PW. Ventriculoperitoneal shunt occlusion due to spontaneous intraabdominal knot formation in the catheter. Case report. J Neurosurg 2006;105:231-2. 7. Micheletti C, Marenduzzo D, Orlandini E, Sumners DW. Knotting of random ring polymers in confined spaces. J Chem Phys 2006;124:64903. 8. Warf BC. Comparison of 1-year outcomes for the Chhabra and Codman-Hakim Micro Precision shunt systems in Uganda: A prospective study in 195 children. J Neurosurg 2005;102:358-62.